Envelop your body with the moisture of the L’Occitane Cherry Blossom Shimmering Body Lotion, a lightweight formulation that softens and smoothes skin. Enriched with nourishing shea butter, this body lotion has a light texture that is quickly absorbed, leaving an iridescent veil on the body. The skin is moisturised and perfumed with a delicate and enveloping flowery scent reminiscent of the Provence at springtime. 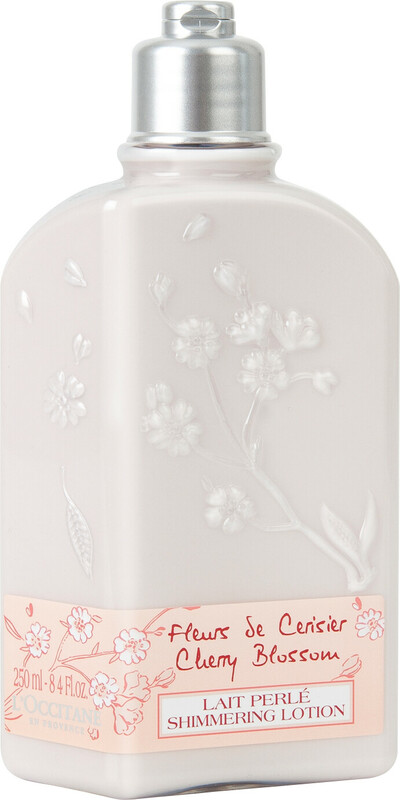 L'Occitane Cherry Blossom Shimmering Body Lotion 250ml is rated 5.0 out of 5 by 4. Rated 5 out of 5 by steffisw1 from A lovely gift Cannot give a personal review as I bought this body lotion as a gift. However, my friend loves it and will be buying more when she has used it all - from Escentual - of course! Rated 5 out of 5 by Staggirl from Cherry Body Milk I ordered this having already used the bath/shower which I am more than happy with. The lotion is lovely to use and the fragrance lasts a long time. This is a nice treat after a long week at work. Rated 5 out of 5 by bazza from Wonderful product - so smmmmmooth & fragrant........perfect choice for that special present ! !